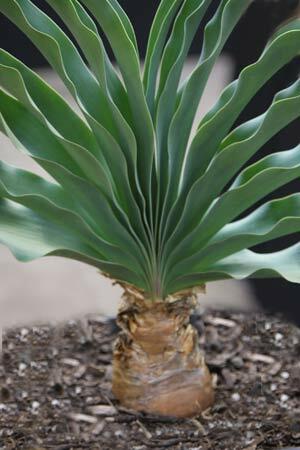 Boophone are a South African bulb that are grown for the striking fan shaped foliage, they add a real architectural statement when grown in a pot or container and look equally impressive when grown in the ground. These wonderful plants will flower, paintbrush like flowers that appear before the foliage. However it is the decorative foliage that attracts most growers. Only three species in this group, Boophone disticha, Boophone haemanthoides and the rare Boophone ernestii-ruschii recently reclassified as as a sub species of B. haemanthoides. All species require very well drained soil, and a sunny position. They need a large container as they do develop a very large root system for their size. B. disticha is a deciduous plant that develops fascinating fan like foliage, flowers vary from light pink to red and are fragrant. Plants are best left undisturbed if you are trying to encourage flowers. Frost needs to be avoided. Avoid water in the winter. Flowers can reach to 30 cm in height. Grown for the architectural look of the fan shaped foliage. Requires water in summer and a dry winter. Best grown in pots so that moisture can be controlled. Flowers are large and pink to red in colour.